New Installation Delivers More Packaging Power! Sustainable printed packaging has become a rapidly growing industry sector; Since the broadcast of the ‘Blue Planet‘ television series many of us are looking for more ecologically sound products and this includes the way in which they are packaged. Why Are We Investing in Packaging? We have been involved with rationed packaging on solid board for many years; and on a short run basis have found ourselves consulted as one of the experts in the industry. This has come about from a long term commitment to packaging in the early 00’s to provide a service for SME’s who were unable to get support with product packaging. The first installation of this technology in the UK! 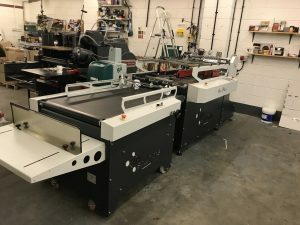 This has led us to further develop our services in Print Packaging and to that end we have recently installed a new box gluing line! This works specifically for short run packaging and in fact is the first machine of it’s kind in the UK. What Can This Machine Do? Our Packaging Team began appraising the various options in the Autumn of 2017 and following a demonstration in Italy we placed the order for our ‘BoxPLus’ gluing line. We have seen great results and this install should allow us to fulfil even more attractive lead times as well as further improve the quality of our printed packaging. We can glue up to 700micron folding box board on the new machine at up to 20,000 per hour!